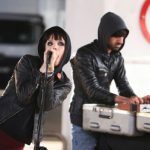 Forum | Crystal Castles | Has it leaked? Crystal Castles are an experimental electronic band formed in 2003 in Toronto, Ontario by songwriter/producer Ethan Kath. Crystal Castles are known for their chaotic live shows and lo-fi melancholic homemade productions. Crystal Castles’ musical style has been described as ferocious, asphyxiating sheets of warped two-dimensional Gameboy glitches and bruising drum bombast that pierces your skull with their sheer shrill force, burrowing deep into the brain like a fever.